Part 2 of our 2015 Wedding Trend Series features an interview with Mandy, floral and event designer with Mandy Grace Designs! Living walls, mixed metals and dreamy, lacy white weddings are just a few of the trends she is seeing and loving for the fall and coming up in 2015! “In Hawaii, we really celebrate nature– most of our events are outside whether its a party on an oceanfront lawn or barefoot on the beach by the ocean. That whole idea of bringing the outdoors in when it comes to event decor is kind of flipped on its head here. We like to bring the indoors out (think chandeliers over wooden farm tables and cool furnishings you’d find in some grand hotel lobby). I tend to shy away from “wedding trends” in an effort to be more natural and timeless so I like to look beyond the wedding world. 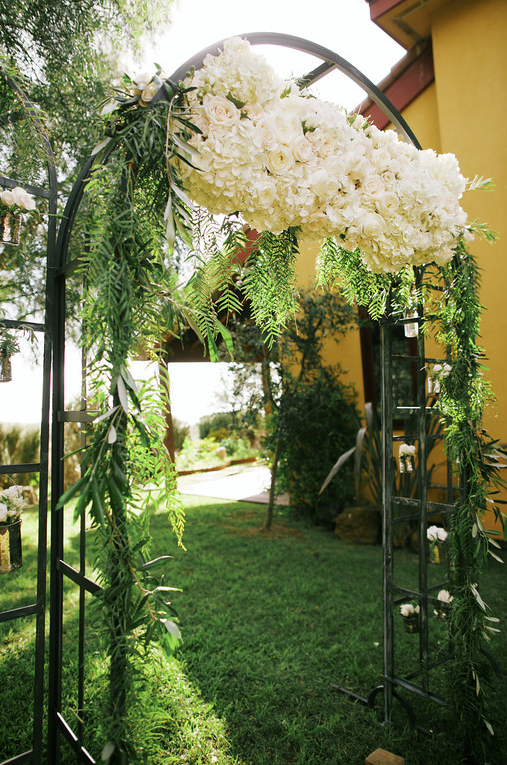 But there are definitely some key floral and wedding design elements that are on my radar for 2015! We have some really interesting ferns here in the islands that add dimension and shape to an arrangement. Whether it’s a “living wall” made up of succulents that is the focal point of the ceremony site or a more simple and sparse installation of greenery on a white canvas backdrop, I love the idea of incorporating greens into the wedding setting. 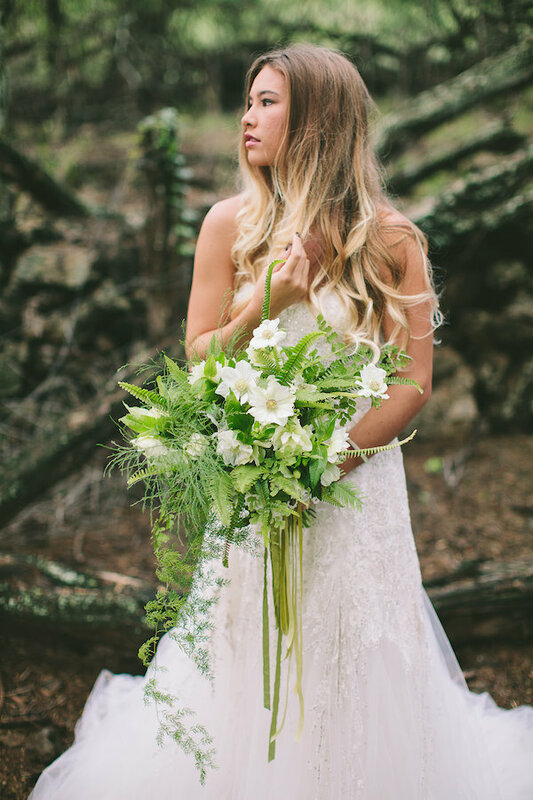 I wouldn’t encourage my brides to eliminate all flowers;) but the possibilities of working with lush greenery are endless. Last year we saw the copper craze take off and I’m still feeling it. You could add more interest with various mixed metals (rose gold, tarnished silver, galvanized tin, brass) to house flower vessels on a table top or lining the ceremony aisle. I love the idea of using copper piping for an arch or overhead lighting. Soften up the look with a monochromatic white color story and you’ve got that mix of feminine and masculine going on– perfect for a wedding! 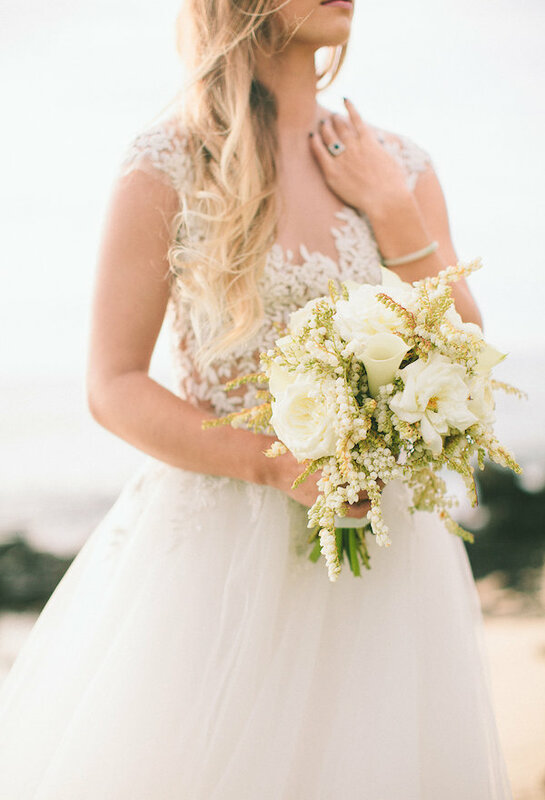 Mahalo to Mandy for sharing your beautiful designs and your insight on wedding trends with us!